The Sands of the Kalahari Desert cover nearly three quarters of the land area of Botswana and, with many vastly differing eco-systems, provides some of the most intriguing travel destinations in Africa. Formed after the break-up of the super continent of Gondwanaland, the Kalahari Desert is today a place of mystique and fascinating features. Not a true desert in the sense of endless and un-vegetated sand dunes the Kalahari is considered a desert because of the sand layer that stretches from the Northern Cape Province of South Africa into the Central African rain forests. 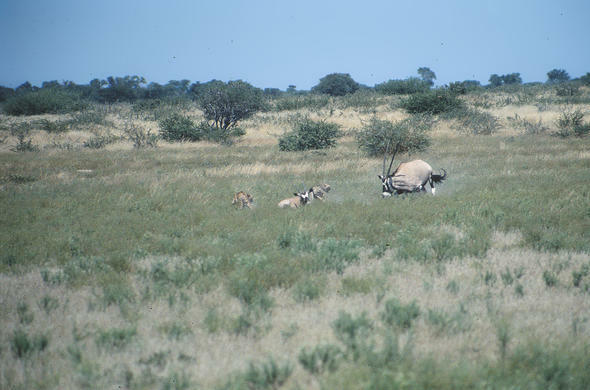 In no country is the desert as dominant as in Botswana where most of the country lies on the Kalahari Sands system. What makes the Kalahari in Botswana so unique is that within its embracing sands are found some of the most spectacular wilderness areas, including the Okavango Delta, a fascinating web of channels and islands providing for a menagerie of wildlife. At one time much of the present day Kalahari in Botswana was a vast inland lake that slowly choked on the windblown sands prevalent at the time of the settling down after the break-up of Gondwanaland. Great rivers, including the Zambezi and Chobe are thought to have poured their water into the lake but over time both rivers changed their course and today the Okavango is the sole flowing remnant of the lake. It is believed that the Okavango will also eventually wither to nothing more than a stream. Today the ancient lake, or signs thereof, can be seen in the vast salt pans of Makgadikgadi and the dry rivers that cross the wilderness areas of Northern Botswana. Northern Botswana is a veritable wonderland of rivers and fertile plains, and visitors can be forgiven for shaking their heads in disbelief at the idea that the area is all in the middle of the Kalahari Desert. What is most astounding though is that one of earth's most incredible wetlands is part of the Kalahari. The Okavango Delta is fed by the Okavango River that rises 1700 km away in the highlands of Angola before flowing out into the sands of the Kalahari. Where the river ends it provides for a myriad of creatures in a place that can truly be considered a blueprint of Eden. The main features of the Kalahari in Botswana are without doubt the Okavango Delta, the Central Kalahari and the Makgadikgadi Pans and these can be experienced on a safari of choice to Botswana. To get a perspective of the ancient lake a flight over northern Botswana will reveal the pans and dry rivers that were once part of the lake - or the option is there to simply enjoy the pristine surroundings at any one of the Kalahari lodges and other accommodations that are available for visitors.